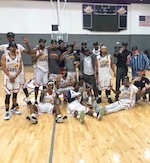 For the first time this season and for the first time in 20 straight regular season games the #1 ranked and defending ABA Champions Southeast Texas Mavericks (9-1) suffered defeat at the hands of the Gulf Coast Flash on the Mississippi Coast. The Mavericks found themselves in a tough and hard fought game on Tuesday night, December 21st as Freeman Taylor (6'6''-F-81, college: Robert Morris) and the rest of the Flash battled the Champions from the opening tip. The Mavs found themselves down by 16 points early in the second quarter. Myles Thrash (6'0''-G-77, college: Stillman) came off the Mavericks Bench to start a 21-2 run that put the Mavericks back up by 5 points 58-53 at half-time. Taylor led a consistent effort in the third period of play and the Flash tied the game 80-80 heading into the fourth quarter. The teams battled shot for shot until SETX pulled ahead by 5 points with four minutes to play. The Mavericks took that lead into the final minute of play, but missed four of five free-throws down the stretch and the Flash converted to pull ahead by 2 with 4.4 seconds left in the game. When Odell Bradley missed on a 3 pointer set up off of a full-court play at the buzzer the Mavericks winning streak was over and the Flash had a hard earned 2 point win. Josh Pace (6'6''-G-83, college: Syracuse) led the way for SETX with 25 points and 14 rebounds. Thrash scored 23 points. DeSean White (6'8''-F-86, college: Northwood Fl.) chipped in 15 points. 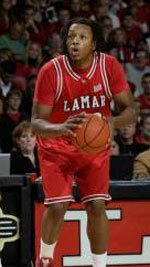 DeRon Rutledge (6'6''-F-75, college: Tex.A&M-Kingsv.) followed up with 12 points. Taylor had a banner night with a game high 27 points and 13 rebounds. Courtney Brown (6'7''-F-71, college: SW Minnesota St.) and Carl Henderson (6'7''-F, college: S.Mississippi) each scored 14 points respectively. The Mavericks are off until after Christmas and will host the SETX Mavericks Holiday Shoot-Out Classic at their NJEC Arena in Winnie, TX. The Texas Fuel, Houston Red Storm, and Arlington Bulldogs will also participate in the Classic. Games will be at 6 PM and 8:30 PM on Tuesday, December 28th and Thursday, December 30th.